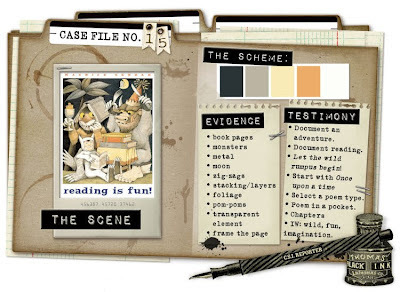 Today another case file is open for investigation over at CSI: Color, Stories, Inspiration. And I got to play along since The Paper Bakery is sponsoring them. The colors were a bit of a challenge but I had fun with them once I found the right ones. As you can see I had some fun using some SC stamps. For the Evidence I chose to use a background paper that had a frame around it and my picture and other elments have lots of layers. Oh how I love this!!! That postage frame is the best and I so love the colors you used. This is a beautiful page Angie!!! I love how you used her own handwriting too!!! Great colors and I love your design and the layering work! you nailed it~awesome work, Angie!!! Button, Button who's got Buttons?